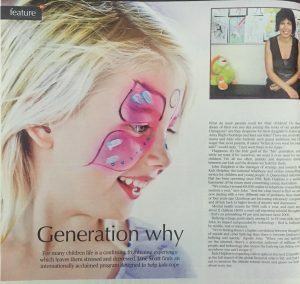 This is an extract from a magazine that is about the new generation of children called “Generation why” and how they can deal with depression. This can be done with the Fun Friends program developed by Dr Paula Barrett. Happiness: it’s the holy grail of the “Me” generation, and while we want it for ourselves, we want it even more for our children. Yet, all too often, anxiety and depression stand between our kids and the dreams we hold for them. John Dalgleish is the manager of strategy and research at Kids Helpline, the national telephone and online counselling service for children and young people. A Queensland initiative that has been operating since 1991. Kids Helpline is a useful barometer of the issues most concerning young Australians. Mental health counts for 5500 calls a year, and each about 11 children (4000 a year) call reporting suicidal thoughts — that’s an astonishing 45 per cent increase since 2006. Bullying is huge, particularly among 12- to 14-year-olds, says John, its impact compounded by technology — that is, bullying by mobile, text or internet. Kids Helpline is expecting calls to spike in the next 12 months as the full impact of the global financial crisis is felt, and that’s not to mention the climate-related doom and gloom we hear about every day. It’s enough to make a parent feel helpless and overwhelmed, but the good news is that resilience can be taught, a negative glass-half-empty child (or adult, for that matter) can learn to see lite more positively and, with early intervention, it is possible to “vaccinate” a child (metaphorically, of course) against anxiety and the subsequent increased likelihood of depression. Luckily for Brisbane parents, Dr Paula Barrett, an internationally-recognised expert in this area of child psychology, lives right here in our city. (…) adjunct professor at the University of Queensland’s School of Education, Dr Barrett is a diminutive Portuguese powerhouse whose work is making children around the world happier. She says early across-the-board intervention – as opposed to selectively targeting only high-risk children – is crucial. The intervention comes in the form of simple, fun programs she has developed in which children learn social and emotional skills to deal with difficult or challenging situations in life. There is talk of “red” thinking and “green” thinking and selecting healthy role models. In adolescence. the emphasis is on choosing positive friends who bring out the best in you. When delivered across a whole school, the power of peer-to-peer learning kicks in and even confident, apparently resilient children will benefit. While there have always been anxious children, Dr Barrett says, the factors protecting us against mental illness have weakened in the last two generations. Strong, extended family or community support networks are absent from many children’s lives, rates of sleep and exercise have decreased (“exercise promotes neuroplasticity — if you want your brain to grow, you have to move,” she says) and poor nutrition is affecting physical and mental health. Financial stresses on parents also mean that levels of strong, unconditional attachment. promoted by the full-time care of babies in their first year by a parent or grandparent, are under pressure. On this point Dr Barrett is cautious – “I don’t want mothers to feel guilty,” she says – but she welcomes the federal government’s moves towards a maternity leave scheme. Other factors that put children’s mental health at risk include daily pressures on families; an inescapable media culture that focuses on bad news; and temperament: one child in five is born more sensitive than others and more vulnerable to depression. Also, our predominantly Anglo-Saxon culture does not allow children to be children for very long, Dr Barrett says. 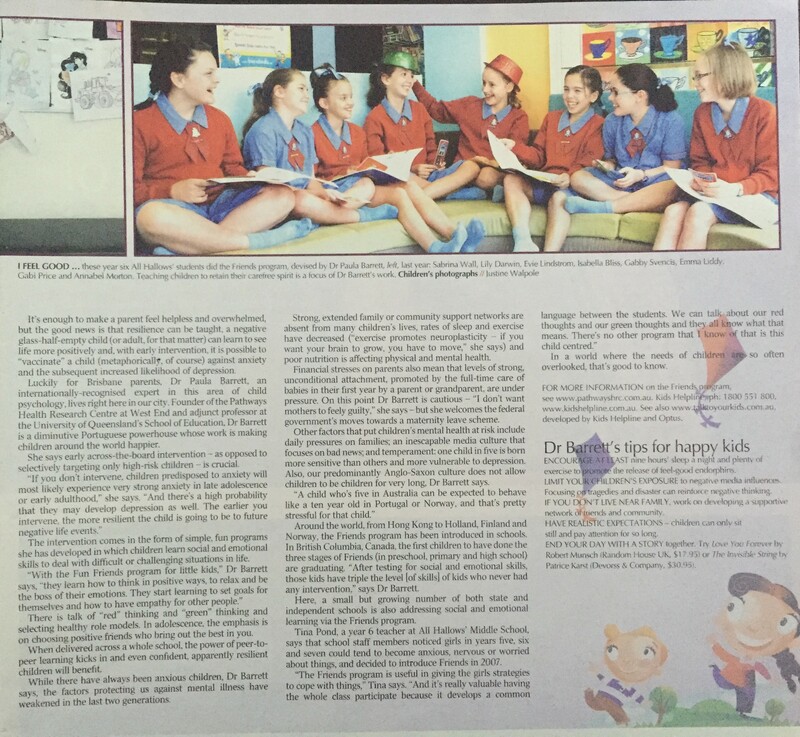 Around the world, from Hong Kong to Holland, Finland and Norway, the Friends program has been introduced in schools. In British Columbia, Canada, the first children to have done the three stages of Friends (in preschool, primary and high school) are graduating. “After testing for social and emotional skills, those kids have triple the level [of skills] of kids who never had any intervention,” says Dr Barrett. Here, a small but growing number of both state and independent schools is also addressing social and emotional learning via the Friends program. Tina Pond, a year 6 teacher at All Hallows’ Middle School, says that school staff members noticed girls in years five, six and seven could tend to become anxious, nervous or worried about things, and decided to introduce Friends in 2007. ENCOURAGE. AT LEAST nine hours’ sleep a night and plenty of exercise to promote the release feel-good endorphins. IF YOU DON’T LIVE NEAR FAMILY, work on developing a supportive network of friends and community. HAVE REALISTIC EXPECTATIONS – children can only sit still and pay attention for so long.